I’ll say this about backcountry trail work – having horses carry your gear sure makes it easy. In June, the Mountains to Sound Greenway Trust and the Back Country Horsemen of Washington (BCHW) joined forces with the U.S. Forest Service to help maintain the Waptus River Trail, a beautiful hiker- and horse-friendly trail in the Cle Elum Ranger District of the Okanogan-Wenatchee National Forest. Located only about an hour and a half from Seattle—leaving from the Salmon la Sac trailhead at the north end of Lake Cle Elum—the Waptus River Trail meanders pleasantly along a series of gentle rolling hills, along the eastern edge of Polallie Ridge and Cone Mountain, crossing a few streams before joining the Waptus River, which it then follows, on and off, to Waptus Lake. The views offered by this scenic 10-mile trail are truly fantastic, and the trail’s natural contours make it a perfect gateway to the Alpine Lakes Wilderness. 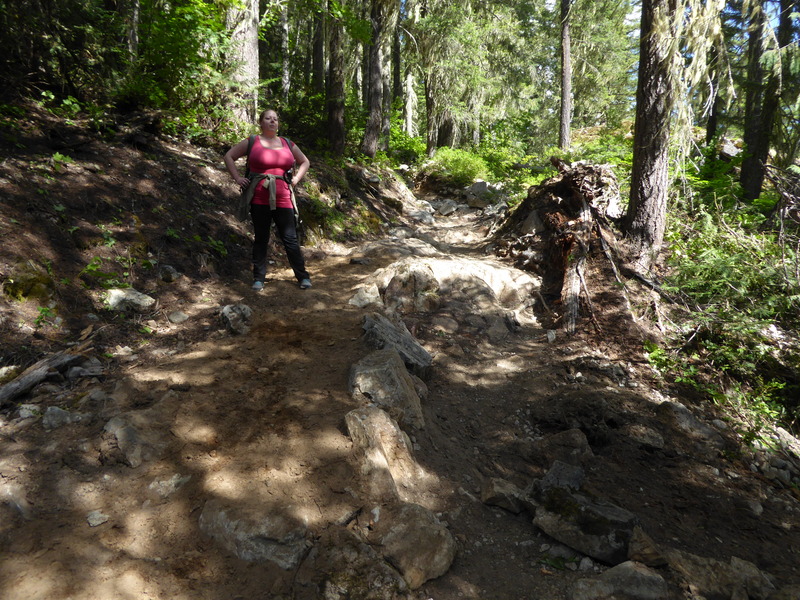 Unfortunately, the rough surfaces and blowdown along stretches of this trail can be unsafe for hikers and non-hikers alike. 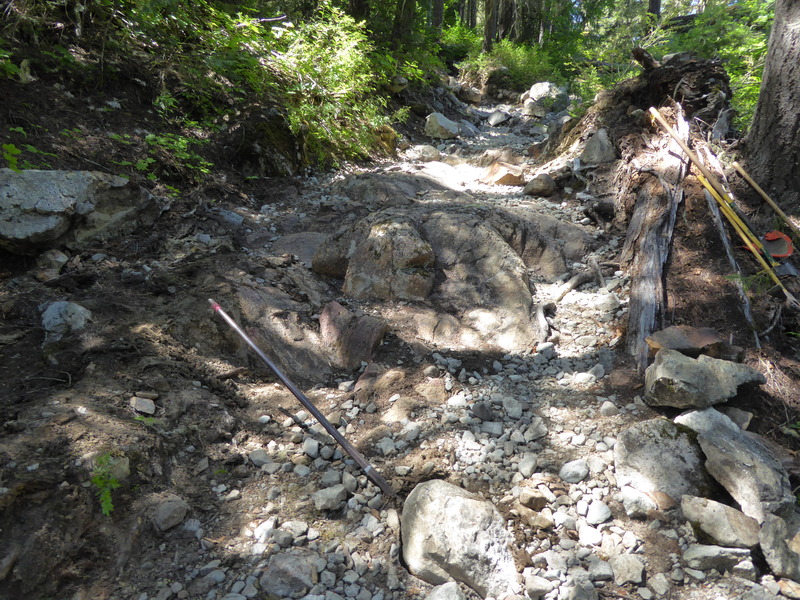 In response, the Greenway Trust teamed up with the BCHW and the Forest Service to spend three days performing some much-needed trail maintenance efforts on this beautiful backcountry trail. Hiking out to our project site on Friday (where the BCHW riders had already deposited our tools and gear), the Forest Service’ Lead Wilderness Ranger met us on the trail to identify a few key priorities for our weekend of work. One of these spots was an exposed bedrock face that was a major tripping hazard for horses (our crew saw a horse fall on this very spot on their hike in). Over the next few days, the Greenway Trust’s volunteer crew worked side-by-side with the stalwart volunteers from BCHW to repair a number of project sites. By the end of the weekend, the trail work accomplished was so noteworthy that several hikers stopped to commend the communal efforts. We are very grateful to the BCHW and the Greenway volunteers who helped make the Waptus River Trail a safer and more enjoyable experience for all who visit. In addition to completing some great projects, we also had a fun time – one of our volunteers even brought a backpacking version of bocce ball along! The weather was nearly perfect, the trail was shaded in several of the worksites, the food was good, and the company was grand – what more could you ask for in a weekend? The Greenway landscape has over 1,000 miles of wildland trails, from the popular hikes on Mt. Si and Tiger Mountain to much-less-frequented high elevation trails in the Alpine Lakes Wilderness. These trails are an incredible resource, and an integral part of why we love this landscape. However, in this era of decreasing agency budgets funding for trail maintenance has been significantly reduced, leaving a gap between need and implementation. Now is the time for nonprofits, such as the Greenway Trust, and volunteers to step up and help agencies deal with this discrepancy if we want to continue enjoying these trails for years to come. Funding for the Greenway Trust’s trail maintenance program is provide by the Washington State Recreation and Conservation Office which administers our Recreational Trails Program grant, and through other partners, including REI and the Spring Family Trust for Trails. Don’t hide behind trees or other structures – that’s what predators would do!